Venom is an iconic comic book villain who, with the right film adaptation, could feasibly achieve the level of pop culture ubiquity that the Joker has enjoyed in recent years. This flick is even coming out in time for Halloween, so possibly the filmmakers are hoping that this will be 2018's hottest costume. Any kids wearing Venom masks, however, will only serve as traumatic flashbacks for anyone unfortunate enough to have watched this stinker of a movie. Venom is a woeful mess that's too ridiculous to be thrilling, but way too dumb to be funny. As Tom Hardy gets possessed by a cartoonish extraterrestrial symbiote that melds with his mind and body, Venom is basically The Mask with a slobbery tongue and none of Jim Carrey's slapstick charm. Hardy miserably attempts an oafish American accent as Eddie Brock, a bull-headed and implausibly successful investigative TV journalist who torpedoes his career when he tries to take down crooked pharma-villain Carlton Drake (Riz Ahmed). During a space expedition to a comet, Drake's company discovers a couple of parasitic aliens; rather than reveal this incredible discovery to the world, however, the power-hungry Drake instead performs a series of dangerous scientific trials in order to create a human-alien hybrid. Sure, whatever. The film's dreary, irritating opening act features Hardy wallowing in pity following a breakup with his fiancée Anne Weying (Michelle Williams) and getting mad about his neighbour playing guitar loudly. After far too much moping around, both Brock and Drake both end up getting possessed by symbiotes: Brock becomes the destructive anti-hero Venom, while Drake is the more ruthless Riot. This leaves us with a protagonist and a villain who are basically the exact same character, and the fight scenes amount to little more than wiggling balls of CGI slime. 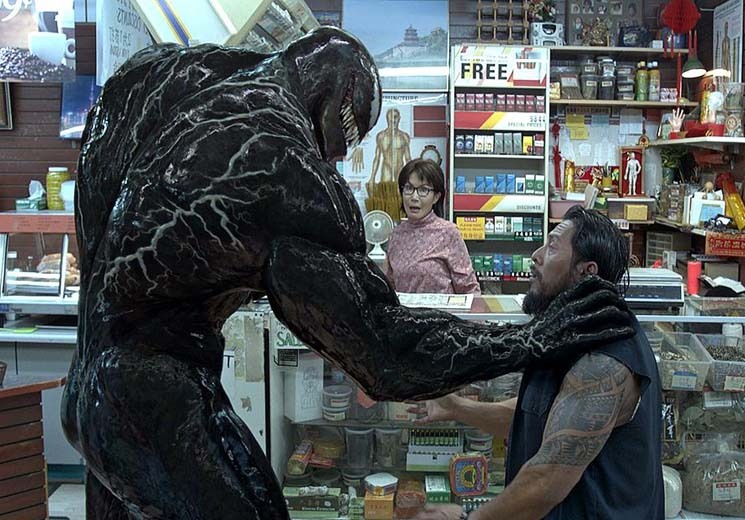 As an origin story, Venom only has the barest scraps of a boilerplate plot, so director Ruben Fleischer mostly subjects the audience to repeated scenes where Brock eats raw food and argues with the comically ghoulish voice in his own head. It's a bit like a buddy comedy minus any chemistry between leads. In the lead up to this film's release, reports emerged suggesting that Lady Gaga's fans had been writing fake reviews of Venom as a way to sabotage its box office performance, thereby helping the opening of Gaga's film A Star Is Born. This is a rare case where the online trolls were doing us all a favour, since Venom should be avoided at all costs.